Whether you are planning a team building event with your own staff or scheduling an important meeting to secure a new client, our on-site staff and professional meeting spaces provide the perfect backdrop for your next meeting. 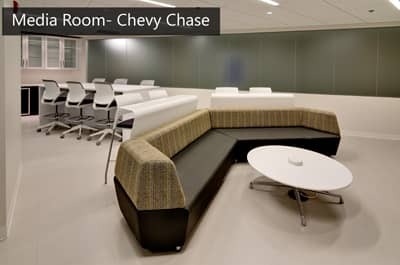 With multiple conference rooms seating up to 20 guests and two training rooms seating up to 50 guests (available at our Chevy Chase and Downtown locations) we will help you reserve the perfect meeting space at a reasonable price point. Our meeting spaces and training rooms can be rented hourly or daily and include room setup, A/V connections, Wifi for all guests, flipcharts and more! Our staff is on hand throughout the duration of your meeting and we work with you before your big event to make sure all the details are taken care of so that you can feel confident when the big day arrives. After the negotiations are over and the meetings have finished, take a little time to celebrate your business success! 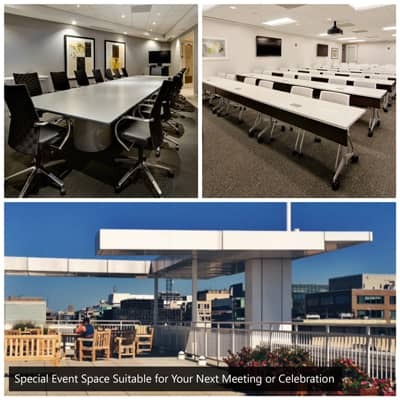 Our Downtown business center features a rooftop terrace that can be reserved for private events with a great view of Downtown DC and Rosslyn, VA. Alternately, our Chevy Chase location features two large business lounges with café style seating and plenty of open space great for networking events and parties. Whether you are celebrating a company anniversary, employee birthdays, closing the deal, or hosting a client appreciation celebration we can help provide everything from the space itself to decorations, catering, A/V equipment, and music. At prices much lower than hotel conference centers, our event spaces are a great alternative providing top notch special event space without the high cost and catering restrictions. We take pride in working with each of our clients to understand the specific vision you have for your event and we know how important it is to present your business well. Let us help you with your next big meeting or special event. Call us or click the button below to find out more, schedule a tour, or check availability.